Alexis Dirks, Knee Bend 3, 2016, archival inkjet print, 9” x 11”. This exhibition is a Featured Exhibition for the Scotiabank CONTACT Photography Festival. The Inhabitants of Space, featuring work by artists Miles Collyer, Derek Coulombe, Erika DeFreitas and Alexis Dirks, takes its title from the dedication of Edwin A. Abbott’s satirical novella Flatland (1962), which breaks down the geographical, architectural, and social structures of the world into a two-dimensional parody. As in Abbott’s book, the artworks included in this exhibition explore three-dimensional space by flattening it, calling attention to the image surface through practices of reproduction and record making. 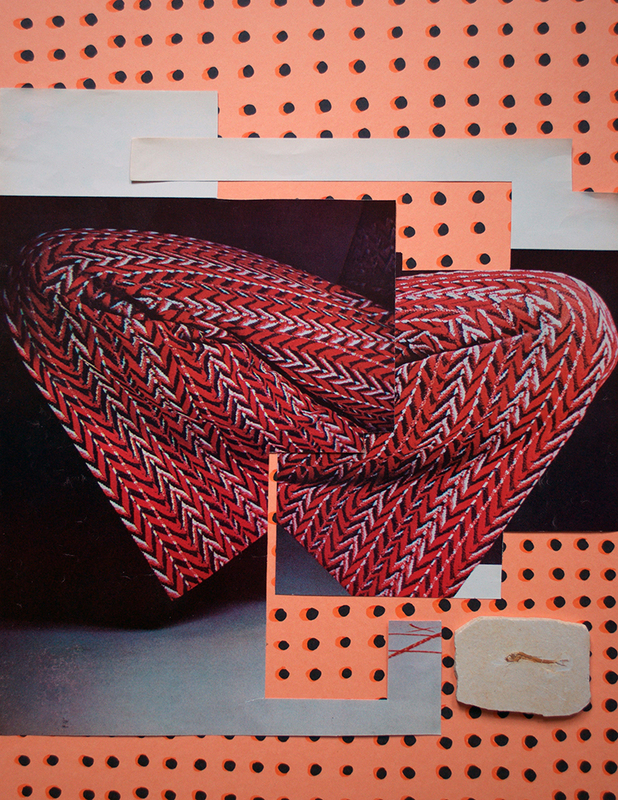 Technologies of reproduction including photography, scanning, photocopying, xerography, and collage are pivotal to the production of each work, while also becoming important elements of their subject matter. The artists confront the ways in which capture and print technologies have affected how we depict, build, and inhabit spaces and images, using photographic and print-based media to process images of raw materials such as concrete, textiles, and plywood. Through these image-based methods of reproduction, material is disembodied to become a symbolic language output on an array of media—all sharing the flatness of paper. Like documents, these works on sheets and films are ultimately records not of material processing, but of the manipulation of ideas related to time, conflict, loss, and representation itself. Please click the button below to download the accompanying brochure. Miles Collyer is a visual artist who works with images and sculpture to challenge the traditional boundaries of photographic practice and aesthetics. His work commonly examines socio-political matters and references visual sources located in the media. Collyer’s work has been published and exhibited across Canada. Solo exhibitions in 2016 include Rumble, Paul Petro Contemporary Art (Toronto) and how do you surrender to a drone?, YYZ Artists’ Outlet (Toronto). Derek Coulombe’s printing practice is concerned with destabilizing representations of space and the body through acts of graphic gestation. Synchronizing collage with various analog printing techniques, Coulombe pictures these radical re-articulations of form and setting. Coulombe holds a BFA from Emily Carr University Of Art and Design (2012) and an MFA from York University (2016). Erika DeFreitas explores the influence of language, loss and culture on the formation of identity through public interventions, textile-based works, and performative actions that are photographed, placing an emphasis on process, gesture and documentation. DeFreitas’ work has been exhibited throughout Canada and the U.S. She has held solo exhibitions at Platform Centre for Photographic & Digital Arts (Winnipeg), Centre  for Print and Media Arts (Hamilton) and The Art Gallery of Mississauga. She was recently longlisted for the Sobey Award. Alexis Dirks pairs images and objects from various origins and moments in history to investigate connections between biological human timelines and deep geological time. Dirks has exhibited throughout Canada and internationally. She has held solo exhibitions at the Briggait Gallery (Glasgow), Gallery 44 (Toronto) and aceartinc. (Winnipeg). Kristie MacDonald is an artist who lives and works in Toronto. Her practice engages notions of the archive and the collection, as well as their roles in the evolving meanings and contextual histories of images and artifacts. MacDonald has recently exhibited her work at BABEL Visningsrom for Kunst (Trondheim, Norway), Reed Collage (Portland), G Gallery (Toronto), The International Print Center (NYC), and Gallery 44 (Toronto). Meghan Price is an artist based in Toronto. Her sculpture, print and video work is rooted in the language of textiles and figures relationships between human time and geological time. Forthcoming and recent exhibition sites include Untitled Art Society (Calgary), AKA art-run (Saskatoon), the Art Gallery of Southwestern Manitoba (Brandon), Katzman Contemporary (Toronto), Idea Exchange (Cambridge) and Blackwood Gallery (Toronto). May 17, 2019 Do you want to take the short-cut or the long-cut?